I'm a fiscally conservative person. I don't believe that debt is good. Period. While I'm happy to spend freely if the resources are there, I vigorously resist the idea of buying things I can't afford. If I can't buy it now, I won't. I would rather live simply than be in debt. This is a foundational value. I drive cars I can pay cash for. I have a modest home. My wife and I have have one credit card, which we pay off every month. We live very slightly under our means, whatever those means may be. Over the last twenty years, this has helped build a comfortable nest egg. If you pay now, and build up savings with whatever remains, then life will be more manageable. It is for this reason that I get, without fail, at least a dozen solicitations for new credit cards every week. Every one of those solicitations is torn up unopened and recycled. Looking at the economic state of our nation, I find myself completely at odds with both political parties. The idea that government can spend without taxing convinced me long ago that the American right is completely insane. 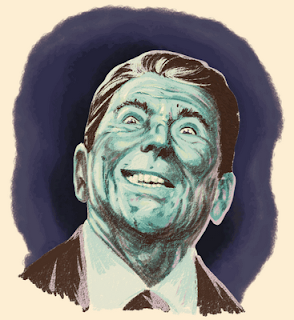 It's been thirty years, folks, since the trickle-down and supply-side lurping of Reaganomics spread like sweet delusion across the gullible of this nation. That hole is just getting deeper. It isn't just a conservative problem, though. The left is equally delusional. Honestly, the point at which I first realized all would not be well with Obama was with the passage of the stimulus. TARP, which was designed to be repaid, seemed necessary. It unlocked a seized-up system. But the stimulus just dug us deeper and deeper into hock, at a time when going into hock had nearly cost us our economy. It was nuts. It was as ill-advised as doing a couple of shots to ward off a hangover. Heck, it was worse than that. It was the economic equivalent of meth. Debt may be the engine that drives our economy, but it is a false energy. Debt-driven spending is not real growth. Yeah, it stimulates. Stimulants like meth are great at that. You feel real good for a bit. Then, less good. Then, crappy, but you'll do anything to feel slightly less crappy. Eventually, you find yourself spent and broken and toothless, living on a stained mattress in some guy's shack in back country Gansu Province. As Republicans continue to shout for lower taxes, and both Democrats and Republicans keep guzzling down debt to expand our security apparatus and our social entitlement programs, I find myself despairing for our nation. The will to do what is needed to change direction...meaning, we pay taxes sufficient to provide for the common defense and support the general welfare, and reduce our spending to levels that make the income/outflow match...that will just isn't there. The last week has been particularly painful. Watching the deficit reduction commission's recommendations get shot down, and then seeing the fiscal irresponsibility of the Bush administration continued by our current administration is as agonizing as watching a dear friend on a self-destructive bender. You know the type. Tomorrow will take care of itself. All they care about is their next fix. Reality is nowhere to be found. And we need to grasp reality right now as a nation. To keep government at non-austerity levels, we'll need to pay for it. That means ponying up, "patriot." If you want to keep taxes where they are, then we need less government. Not empty rhetoric about less government. Real cuts. That means across the board. It means standing down our imperial military, and replacing it with something more fitting a constitutional republic. It means reduced benefits for the elderly and those in need. It means fewer subsidies for farmers. Whichever way, there needs to be some level of diminishment, as we scale back to sustainable levels. It means effort, and struggle, and a bit of shared fiscal pain...not just by the rich, but by everyone. Real recovery involves real effort. But suggesting we all work together to shoulder a mighty burden doesn't get you elected. It doesn't poll well. We'd rather elect reality television politicians, who'll happily pitch out sweet crystal fantasies until that morning America wakes up on that nasty mattress with a mouth full of rot and realizes we lurped America's greatness from our children.